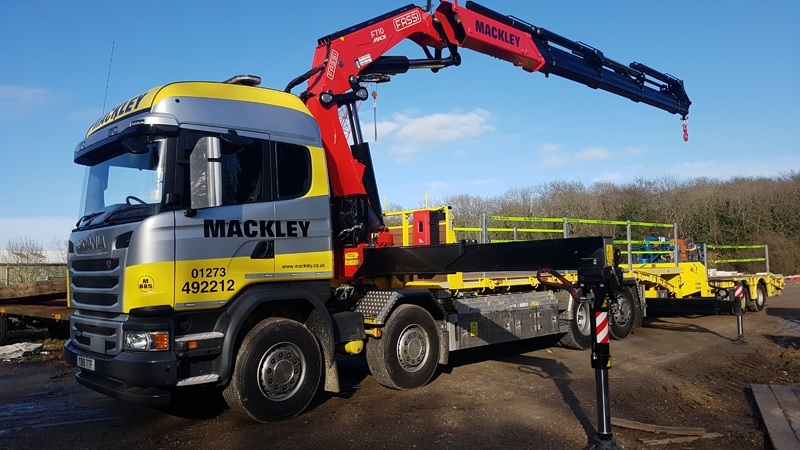 Mackley has unveiled the latest addition to its plant and vehicle fleet, as part of a programme of continual investment to ensure the company and its employees are best equipped to operate efficiently and safely at all times. The new 18 plate Scania G450, bearing the smart Mackley livery, is fitted with a construction spec cab and a 68t/m Fassi 710 crane, which has the ability to lift three tonnes at full reach (16m). The vehicle is also equipped with a ‘cheesewedge’ ramp that can either fold forward to provide a totally flat deck, or be stowed in the vertical position to give more deck space. The new edition also comes with a drawbar trailer which is also fitted with a cheesewedge ramp. The Scania G450 is the latest new vehicle acquired as part of a five-year investment plan. In October 2016, Mackley bought a new Heavy Goods Vehicle and three new Transit Custom Vans, as well as two mobile groundhog units designed to further improve working conditions for teams when on site. David Knapp, Mackley’s Business Development Manager, said: “We believe it is vitally important to continually replace, update and improve our plant and vehicle fleet.